While black curtains are elegant and make a statement, sometimes a person wants to liven them up. Whether it’s for a party, a change of season or perhaps, just a change in your mood, black curtains provide a fantastic backdrop for excitement! The easiest way to change a black curtain is to add a colorful tieback. Tiebacks can be made from bright, contrasting fabric and embellished with hair bows, beads or tassels. Depending on the curtain style, there may be no tiebacks. What then? Changing the valance may be an answer. Again, a bright, contrasting fabric can be used to create a new valance. Embellishing the old valance with neon bows says Wow! If neon is too much; how about a lacy overlay? This breaks up the black and gives a more delicate effect. Not into lace? Try a beaded curtain over the valance or the curtains themselves. Colored beads are dramatic. Clear beads will reflect light and show some sparkle. For even more sparkle, try a sequin overlay instead of beads. Another way to play with light on a black curtain is to add small mirrors to the edges of the valance with water-soluble glue. If the curtains are dry clean only, try removable adhesive poster strips. If using this last suggestion, test a spot before committing to the project. 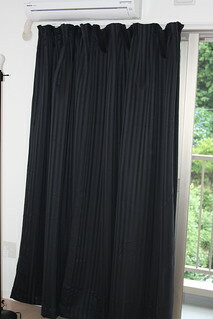 Another simple way to dress up black curtains is to change the color of the shade behind them. Mini blinds come in a multitude of colors and slat sizes. For the crafty person, try wallpapering the pull down shade. There are literally thousands of wallpapers to choose from. For a holiday theme, use gift wrap instead. For those without shades or blinds, a patterned sheer may be a solution. Any sheer fabric such as chiffon, organza, tulle, or netting will work. If you can’t find a prefabricated pattern you like, you can try your hand at stamping, tie-dying, stenciling or even hand-painting for a unique, one-of-a-kind look. Edging the curtain panels or valance is another way to change the appearance of black curtains. Iron on ribbon with fusible interfacing to create a dramatic edge. Craft vertical or horizontal stripes using the same method. A rich jacquard ribbon will evoke a different response than a grosgrain or moiré ribbon just as a complex design will produce a different aesthetic than a simple one. Using this technique, a set of black curtains can be transformed into an Art Deco masterpiece. Silk florals are another possibility for dressing up black curtains. Leafy or flowering vines pinned to the rod pocket of the valance will lend a more natural, woodland feel to the room. For those wanting to really get back to nature, try grape vines for a rustic appearance. Black curtains can be dressed up or down in a variety of ways to fit your changing décor or mood. In fact, black curtains may be the most versatile of all.